Today’s top brands are finding ways to harness user-generated content (UGC) to boost the effectiveness of their campaigns. Whether it’s in the form of a consumer-written blog post, a 5-star review, a ReviewTrackers YouTube video, an Instagram photo or story, or a social media comment, UGC can add great value to your marketing efforts and initiatives — and deliver results that aren’t always achievable using traditional brand-centric strategies and inauthentic advertising. Using UGC in marketing is cost-effective and ideal in today’s social-media-driven world; it also strengthens your brand credibility, promotes instant outreach, and fosters authenticity and consumer trust. If you’re interested to see how top brands are incorporating user-generated content into their marketing activities, check out these great examples below. When it felt like it was losing its “cool” factor among Australians, Coke decided to make a small change to its product: by printing 150 of Australians’ most popular names on its cans and bottles. These were then put into sales rotation across the country as part of the “Share a Coke” campaign. Additionally, Coke created a page on its website where people can personalize Coke bottles with their names. The result? 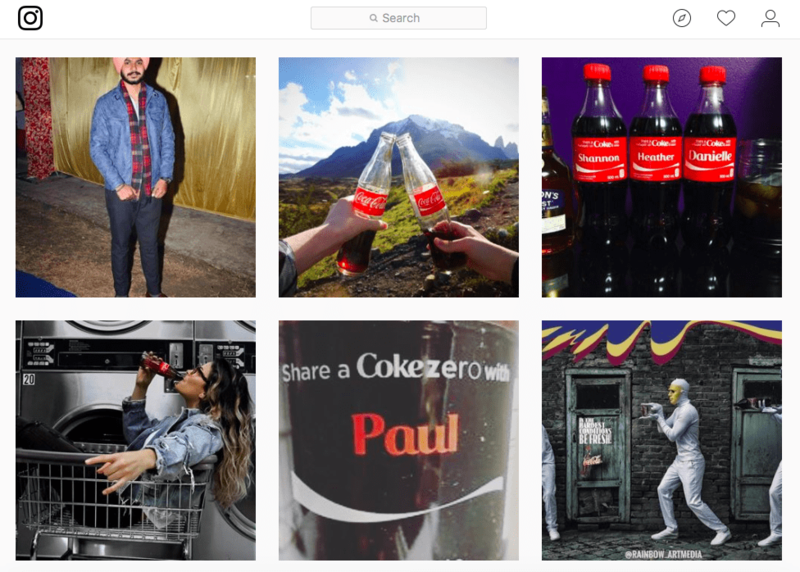 Customers engaged with the campaign and shared pictures of their cans and bottles on social media, fueling the production of UGC that mentioned the brand and contained the campaign hashtag. “Share a Coke” has also since been rolled out in more than 80 countries around the world. Every major smartphone manufacturer can claim to having the best phone camera right now, or ever. But making that claim is not quite as compelling or effective or authentic as having customers actually vouch for the product. Which is why user-generated content can be such a key differentiator in marketing. Apple puts this into practice with the beautiful “Shot on iPhone” commercial, posted on YouTube, in which the company showcases stunning visuals of Earth shot through the lens of everyday users. By using UGC, Apple not only saved on development and production costs; it also engaged its community of iPhone users, turned them into instant brand ambassadors, and made them feel extra special by putting their own photos and videos on an Apple commercial. By the way, this whole concept extends to include Apple’s official Instagram account, which serves as a showcase of user-generated photos shot on iPhone. User-generated content is perfect for brands hoping to expand their reach on social media. And visual content can help a business increase engagement and communicate more easily with their audience. So imagine how powerful user-generated visual content can be. Fashion retailer Old Navy empowers its customers to create and curate brand content through its #SayHi campaign on Instagram. Submissions are then uploaded to a kind of “social gallery” on the brand’s website, where visitors can shop the look of featured Old Navy customers. Online reviews help build trust and serve as a crucial source of information for shoppers and potential customers. That’s why we love car manufacturer Kia’s strategy of incorporating reviews into their official website. In a section called “Why Kia?”, the company displays online consumer reviews and ratings taken from review sites like JDPower.com and Kelley Blue Book, plus consumer reports with detailed information on specific car models. The idea behind these amazing UGC campaigns is simple: listen to your customers and empower them to share their thoughts, feelings, comments, and experiences. Let them do the talking. Using user-generated content in your campaigns won’t diminish your brand voice; as shown by the examples above, UGC amplifies it — in ways that drive engagement, expand your reach, promote trust, and turn existing customers into brand ambassadors.